For many years, the anatomy of the truck didn’t change – at least, not until the Honda Ridgeline first hit the market. The Honda Ridgeline isn’t your average truck and it offers a number of extra features that make the truck ideal not just for storage, but also for play. Most trucks have limited passenger space, and if they are able to fit five people inside the cabin of the truck, it is a cramped fit. The Honda Ridgeline offers a roomy interior with space for the entire family to be comfortably seated. Not only do you have more passenger space, it also functions as extra cargo space. The second-row seats also fold up, offering space inside the vehicle to store large or valuable items that you are unable to store in the truck bed. On the bed of most trucks, the tailgate opens only one way – folding down to lay flat. 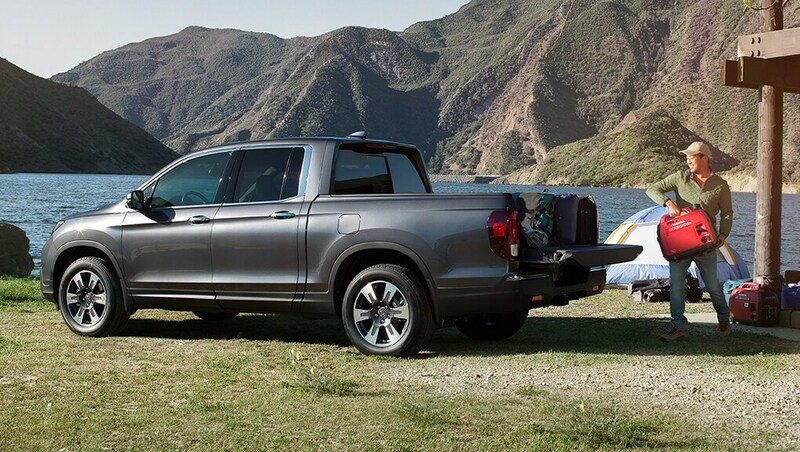 The tailgate in the new Honda Ridgeline opens two ways: the typical folding down to lay flat, and additionally swinging out, similar to the action of opening a car door. This Dual Action Tailgate function is ideal for loading and unloading the bed of the truck. With the Lay-Flat Truck Bed, the Honda Ridgeline has a storage advantage over other trucks. Many other trucks cannot fit items that are larger than 4 feet wide in a way that lays them flat, which can cause damage to the items. The Honda’s truck bed, they easily fit and the Flat-Lay design minimizes the risk of damage. The truck bed in the Honda Ridgeline is much more than meets the eye. Available in the bed is a water-resistant in-bed trunk with a drain plug. The trunk is lockable, making it a great place to store valuables. With the drain plug, the trunk can double as a cooler, keeping drinks and food cold if you are spending the day outdoors. If you are spending the day outdoors, don’t worry about bringing an extra set of speakers – the Ridgeline has you covered. In-bed speakers are available for select Ridgeline models. These speakers can be used to bring music to wherever you are, adding additional fun to every adventure. If you’d like more information about the features available in the Honda Ridgeline, visit us at Henley Honda today. Our Sales Consultants will help you determine the right model for you.